The one and only Leo from Frog Leap Studios shares metal covers, tutorials, how-to videos and other fun, super rad stuff with his audience of over 2.3 MILLION subscribers. 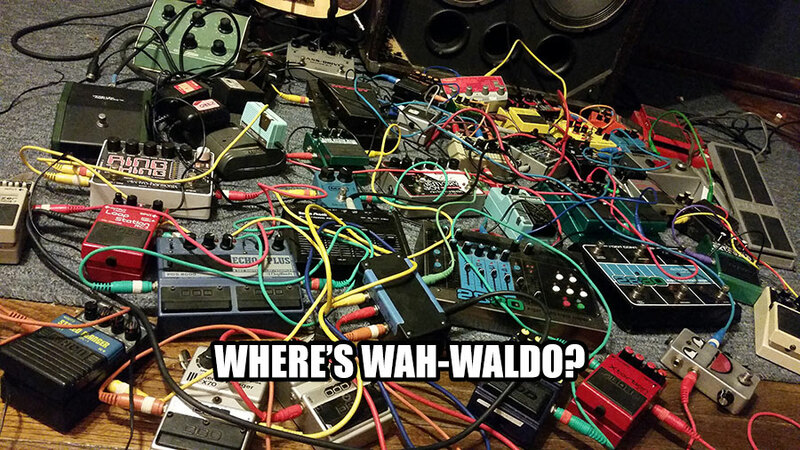 He’s also a PreSonus user! We recently caught up with Leo at NAMM this year and partnered with him for his next adventure, the StudioLive 32 Series III! Watch him open and set up his new StudioLive and then make music with a Hockey Stick… yep! 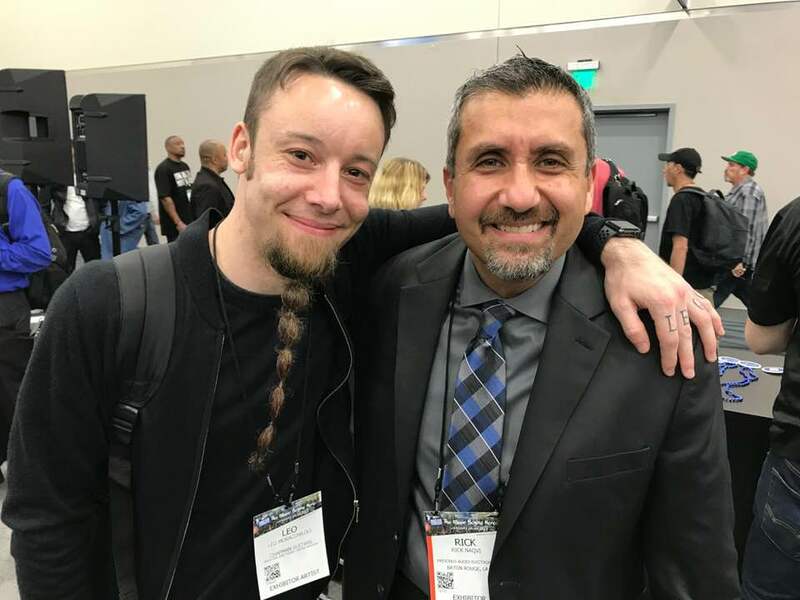 Leo and Rick at NAMM! When announcing the winners of a contest, it’s customary for someone in my position to say something to the effect of “choosing a winner was hard.” That was less the case with our BIAS FX Caption Contest—the winners here really stood out from the rest of the pack, and each member on our highly-qualified panel of humorists laughed with equal aplomb at the Grand Prize Winner. But first, the runner-ups. 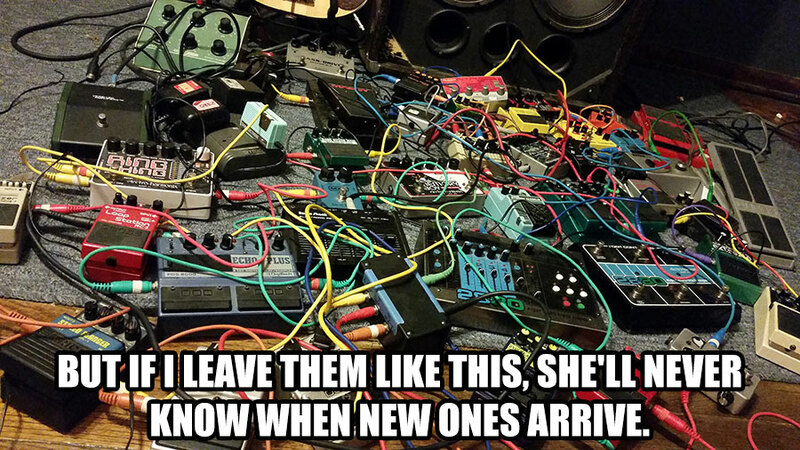 The following two captions deservedly win an AudioBox iOne Interface, Studio One 3 Artist, Progression 3, and BIAS FX for iPad. Next up, from Matt C., should probably win some sort of Dennis Miller bonus award for its left-field reference. Plus, when you look at the age of most of the pedals in the shot, his choice of “1989” is kinda dead-on. 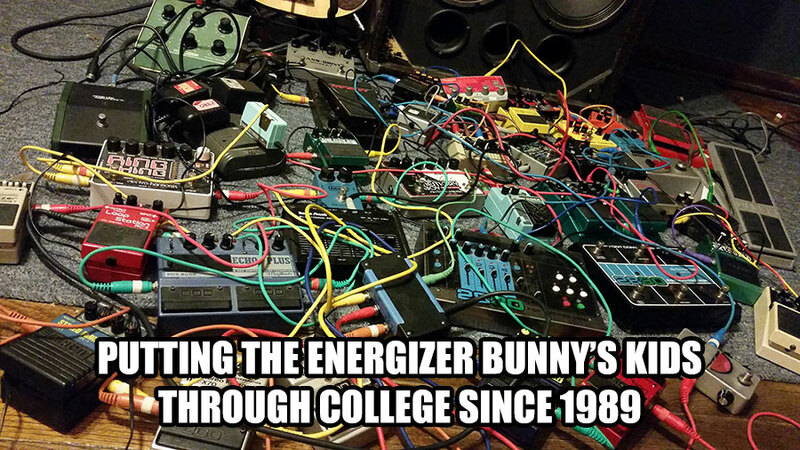 The Grand Prize winner below was submitted by Jeff K. When you consider the letter-to-humor ratio here, you’ve got one of the most efficient funny captions in the history of such contests. Jeff wins the big ol’ prize batch of Studio One 3 Professional, Progression 3, an AudioBox iOne Interface, BIAS Amp Pro, and BIAS FX for iPad. Congrats and thanks to all for participating—we’ll be e-mailing the winners ASAP. With the arrival of the StudioLive RM-series rackmount mixers, we’ve received a lot of questions about the functionality. 96K? Can they be cascaded? What about the Dante cards? When can I get one? We’ve answered those questions (and more) in the RM-series mixer FAQ, which can be had by clicking here. But we’ve also gotten a lot of other questions that we feel are worthy of their own FAQ—particularly regarding Ray’s beard. While we understand and appreciate your curiosity, we have had to keep some secrets for a while for competitive reasons—but, the cat is out of the bag and we can go public with the announcement of the Garibaldi FH16K. Read below for more info. The Garibaldi FH16K is a true-analog face-mountable beard that allows for maintaining facial warmth in the coming winter months, as well as unsurpassed soup and juice filtering. Beta testers of the Garibaldi have reported up to a 30% increase in their dates-per-week ratio shortly after concluding installation. Garibaldi is compatible with all walks of life, and enjoys cross-fashion compatibility with both corduroys and flannel. While currently only compatible with human males over the age of 14, we plan to broaden availability to women and younger users through a hormone therapy add-on kit available in Q3 2015. At the time of this writing we have no plans to make the beard available to Androids. Q: Is the Garibaldi FH16K difficult to maintain? 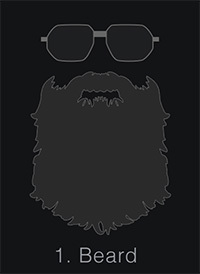 A: Not really, but carrying the weight of the beard consumes approximately 200 calories daily. 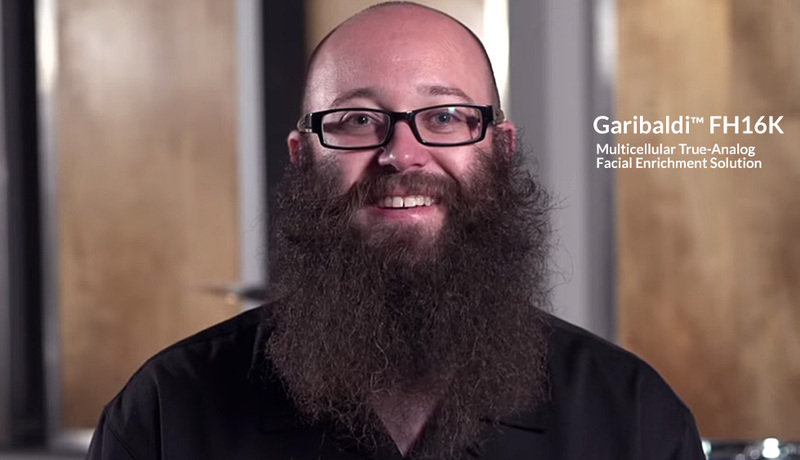 Q: Does UC Surface contain a beard Channel Type preset? A: Yes. It was released as part of the most recent UC Surface update, which can be downloaded by clicking here. It is accessed from the Channel Info menu. Q: Any affiliation to the cast of Duck Dynasty? A: No. Ray is from the Northwest. Q: Ray has more hair on the bottom half of his head than the top half. That’s weird. A: This is not a question. A: Not available at this time. Q: When does it ship? A: The Garibaldi FH16K is available to begin growing immediately, with full installation concluding in 2-3 years. Q: What networking options exist? A: There is no Dante option planned, as Dante Alighieri (the great Italian poet who wrote the Divine Comedy) was clean-shaven. AVBeard is being considered. Q: What customization options exist? 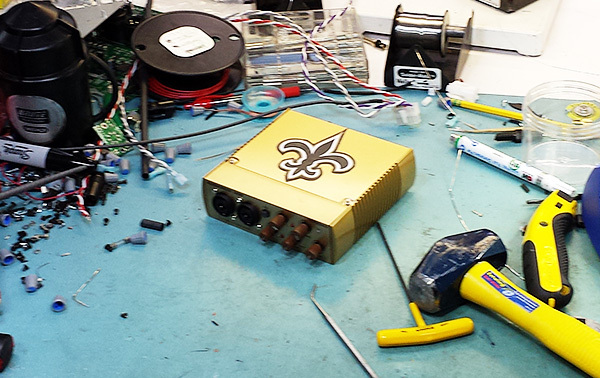 As a commitment to constant improvement, PreSonus Audio Electronics, Inc., reserves the right to change any specification stated herein at anytime, without notification. Hey guys, let me start by thanking you for your generosity! The PreSonus RC 500 will be cared for like a family member, but worked like a mule! Potluck Audio Conference is a meeting of the minds where vendors, musicians, engineers, producers, fans of audio, and/or anyone else with a set of ears can travel to Tucson, Arizona in 100+ degree weather to share ideas, techniques, and many other valuable aspects of their respective industries. Craig Schumacher from WaveLab Studios is the guy to thank for this amazing event. Craig Schumacher is also an instructor at Scottsdale Community College, which happens to be two hours away from his residence and studio in Tucson. How and where he finds time to teach us is still a mystery, as he is constantly pulled in at least three directions at any given time. The guy is a blessing to us all! This year Craig asked me to attend the event as a participant in a panel sponsored and engineered by Sweetwater’s very own Mike Pinotte and Austin Moss. The guys used one of the songs I created and had me track a verse to use in their Vocal Recording panel. It was a great experience, needless to say. Currently I am a student at Scottsdale Community College. The degrees I’m acquiring are in Supply Chain Management and another in Audio Production. This doesn’t leave me much time for work, so the last year was a little rough as I had to quit my job and focus on school. As a result of the sacrifice, something VERY cool happened; my mixes started to get better, and people started to give me money to make their recording sound better. Once again, I’d like to thank you for your kindness. Your company and the awesome gear you create are now a part of our collective efforts to keep the music alive! Another solid gold cover from the StudioLive fans over at Frog Leap Studios, who maintain a consistently high rate of quality, creative output. Thanks guys! An interesting bit of recording industry foreshadowing, discovered in a thrift store by our own Carl Jacobson! 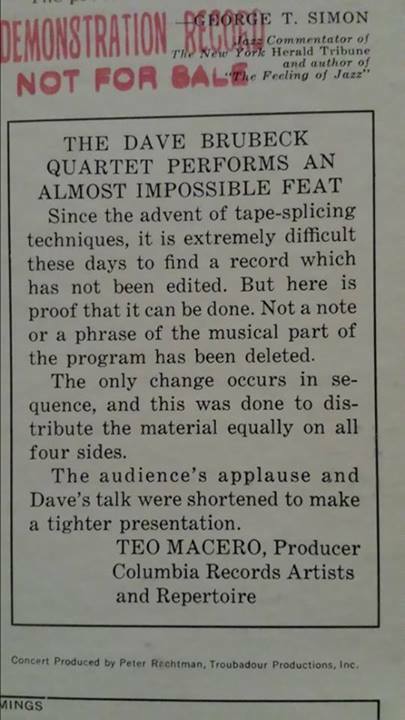 This pic is snapped from the back of 1963’s “Dave Brubeck Live at Carnegie Hall.” Tape splicing to edit a performance may seem downright quaint by today’s standards, but this raises a great discussion. What would Teo Macero say about today’s editing practices in music? And when it comes to editing a performance, where do you draw the line—if at all? What will you NOT do? Here’s a great video covering the soundtrack production for “Man of Steel,” the latest cinematic adventures of DC’s Big Blue Boy Scout. If you’ve ever tried to get just the right drummer for your project/band, this video may well make you cry, as Hans Zimmer gets to use Matt Chamberlain, Sheila E., Josh Freeze, Pharell Williams, Danny Carey, John JR Robinson, Jason Bonham, Satnam Ramgotra, Toss Panos, Jim Keltner, and more—simultaneously. Once you’ve recovered from geeking out over a dozen of the world’s best session drummers all working together in the same room, take a closer look at the studio setup for this. The group performs on twelve risers arranged in a circle, with all individual drums miked, plus overheads, plus room mics. The result is a thunderous surround-sound mix of drum bangin’ that puts the listener in the middle of what must have been the world’s greatest drum circle. New Photos from Camp Jam in Atlanta! These kids are growing up right, using Studio One and the StudioLive mixers to learn recording and mixing. The StudioLive 16.4.2 is being used to mix and record performances from both the campers and visiting artists! Studio One Artist continues to be the DAW format for our recording/songwriting class. The features and simplicity of StudioLive and Studio One have our camps running smoothly, and make a real difference in the sound of the recordings and performances. 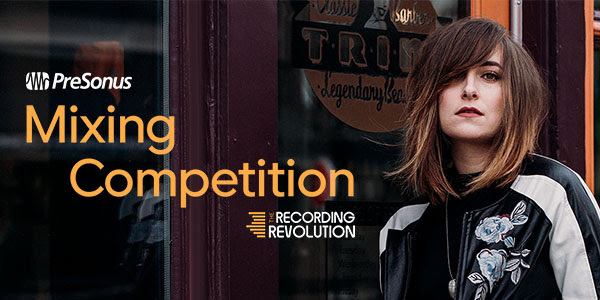 Campers are all being given a PreSonus code to download Studio One Artist. 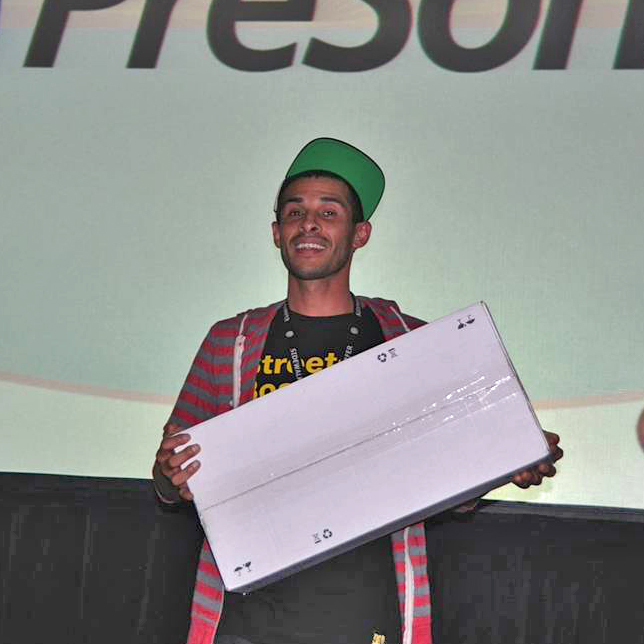 We could not be happier with PreSonus and their efforts to support Camp Jam and music education! THANKS TO ALL OF YOU. YOU ARE INCREDIBLE! These are pictures from Atlanta—we will send from other cities as we move through the summer. If you’re interested in Camp Jam, please contact us, summer classes are filling up fast!